Shohei Ohtani is back from the DL for the Los Angeles Angels. But he’s not all the way back. The two-way Japanese sensation is about to become a one-trick pony. The Angels activated Ohtani from the 10-day DL on Tuesday after a little more than three weeks on the shelf with an elbow injury. However, he is coming back purely as a hitter as the team waits to see if his elbow is healthy enough for him to return to the mound as well. Ohtani was sidelined last month with a Grade 2 strain of the ulnar-collateral ligament in his right elbow. It’s an injury that can sometimes lead to Tommy John surgery in for pitchers. However, Ohtani has been given platelet-rich plasma injections in hopes of avoiding surgery. It’s been more than three weeks since Ohtani first went on the DL. The Angels initially hoped to re-evaluate Ohtani after those three weeks. 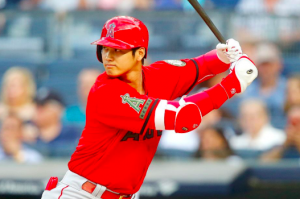 However, Angels GM Billy Eppler said Tuesday that Ohtani will be given another three weeks until a decision is made on whether he’ll be able to pitch this season. Epple stressed that doctors have not indicated at this point that Ohtani will need surgery. If he does need surgery, it likely won’t be performed until after the season. As they wait, Ohtani was cleared to return to hitting last week. Since then, Ohtani took two days of batting practice and then participated in two simulated games. Based on that, the Angels believe Ohtani is ready to rejoin their lineup as a hitter. Prior to going on the DL, Ohtani was hitting .289 with an OPS of .907. With the Angels quickly losing ground in the playoff race, they’ll be glad to welcome Ohtani back to the lineup. Since he won’t be pitching, the Angels can now use Ohtani in their lineup every day. That will give him more of an opportunity to make an impact offensively. Of course, Ohtani will only serve as a DH. That will require Albert Pujols to play first base every day. Pujols has been the team’s primary DH this season, but he’s had to play a lot more first base this season than in past years to accommodate Ohtani. With Ohtani potentially the full-time DH over the next few weeks, it’ll force the 38-year old Pujols to spend more time in the field. Considering where the Angels are in the standings, they’ll gladly take that tradeoff. Doctors have assured Ohtani that swinging a bat won’t do any further damage to his pitching elbow. With that in mind, they’ll take anything they can get from him. It remains to be seen whether Ohtani will take the mound again this season. But in the meantime, the Angels can at least get his bat in the lineup in hopes it’ll get them back on track.